One of the unique features of the body scan meditation is that you do it lying down, making it an ideal meditation for you to begin with, as you don’t need to hold your body upright for long periods of time. The body scan slowly shifts your attention through your body, usually beginning with the toes and finishing with the top of your head. Find a place to practice when you won’t be disturbed (turn off your phone!) and where you feel warm and comfortable. You can practice the meditation at any time of day, but if you do it too late in the evening, you may fall asleep. Having said that, the body scan can help overcome insomnia. The experience takes between 15 and 45 minutes, depending on how intensively you wish to practice. Lie on your back with your legs a little apart from each other and your arms slightly away from the sides of your body with your palms facing upwards. Cover yourself with a blanket if you need to, as your body temperature may drop in the practice. If this position is too uncomfortable, try raising your knees to release tension in your lower back, or choose any position that feels right for you. Become aware of your inner attitude. Let it be. Allow and accept whatever happens in the experience as best you can. Let go of any ideas about self-improvement or personal development — mindfulness is about simply allowing yourself to be as you are in a deep and authentic way. Focus your attention on your breathing for a few minutes. Move your attention through your whole body, step by step. Shift your attention from your breathing down to your toes. Feel whatever sensation you can feel. If you can’t feel any sensation, just be aware of the absence of a sensation. Gradually move your attention up through your feet, lower legs, upper legs, pelvic area, lower torso, upper torso, shoulders, upper arms, lower arms and hands. Then up to your neck, face, back of your head and finally the top of your head. This whole process can take 15 to 30 minutes. Each time your mind drifts, notice what it was focusing on and bring your attention back to your breathing. Imagine your breath going into and out of each part of your body as you’re being mindful of it. Imagine that your breath is sweeping up and down your body. As you breathe in, imagine your in-breath starting at your toes and reaching the top of your head. As you breathe out, your out-breath sweeps from the top of your head down to your toes. This sensation can feel healing or relaxing. For the last few minutes of this meditation, try letting go of all effort to be mindful and just be. Rest in your own inner sense of aliveness, of presence, of being. Gently bring the meditation to a close. Hopefully, this has been a deep and nourishing experience, so avoid jumping up straight away or you may feel dizzy. Get up gradually and mindfully, feeling the sensations in your body as you do so. Record your experiences of the body scan meditation. 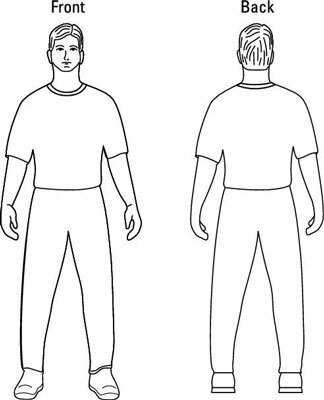 Use the label A to indicate areas that felt relaxed or comfortable during the body scan meditation, B for areas of discomfort or pain and C for areas where you felt no sensation at all. This exercise helps you to reflect more deeply about your experience and can make you more mindful next time you practice.